"Good morning #chinatown!! 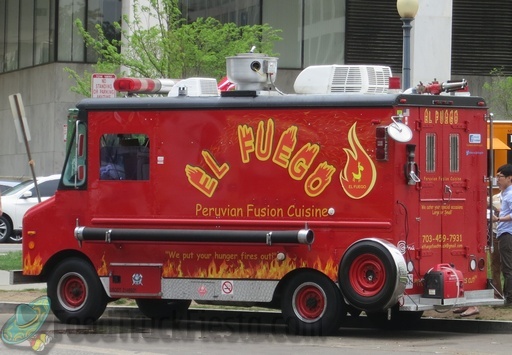 The truck is arriving ready to serve delicious authentic Peruvian food!! Windows open soon! ""
First time trying this truck and I must say my sandwich was excellent!! I go the chicken flatbread that's made with all breast meat and has French fries inside. This was one of the best sandwiches I have had in a long while. Definitely the best food truck I've been to yet. The chicken stir fry is delicious and the sauces you can get on the side are awesome. The french fries soak up some of the juices from the stir fry making them irresistible. Super delicious, and worth the wait. The Lomo dish tastes super good and the side sauces... hmmm. 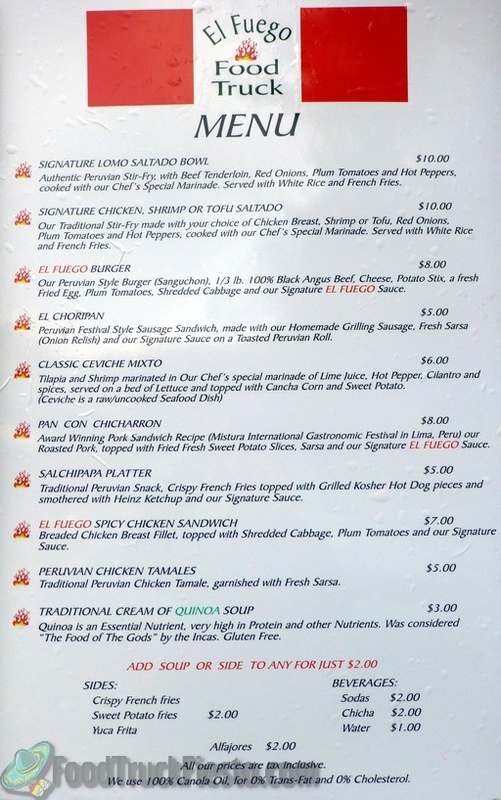 El Fuego is absolutely my favorite truck in town for not just Peruvian food but any food type. Get there early because it's always busy and they do run out of some of the favs quickly. Can't say enough good things about the food, service... and the owner who is very courteous and thankful for the business. Only wished they had more trucks so I could eat there more! I had no idea what I wanted, and while they basically said everything was good, the sandwich I ordered was delicious. I'm not normally a fan of sweet potato, but the play between the its sweetness and the spicy El Fuego sauce was great. The pork was tender and flavorful. Not too big a sandwich but not skimpy either. Easily worth the 8 dollars. I'll go back if they come to Cap South again. The owner was there and chatted while I waited for my food (pretty quick though) and that's nicer than just waiting. Nice work. I cannot resist a burger with fried egg and potato stix! The El Fuego burger was super delicious, the sweet potato fries were nice and thin (I am not a fan of the fat potato wedges)and extra crispy (and neither greasy nor soggy! ), and the tequenos were honestly one of the best things I have ever tasted in my life! All the food was perfectly seasoned (not too salty or overloaded with seasonings) and tasted fabulous! I gave only 4 stars because I was specifically asked how I would like my burger cooked, and I replied "Well done, please," but was given a burger that was still pink and even red in some spots. It was still amazing, and that will not stop me from coming back to El Fuego again. Plus, those sauces are incredible! Excellent Pan con Chicharron pork sandwich! Will have to get it again, tons of flavor! Wow, this is some of the best food I've eaten off a truck yet. Flavors were spot on and every bite was delicious. Even the sweet potato fries were great. Definitely going to go back to try more off their menu! Make sure you take a look at the Specials, they have some great options on there as well. Service was a little slow but they were busy and the wait was well worth it. The pork sandwich was DELICIOUS!!! So full of flavor and super tender. The bread was toasted and fantastic! Good portion size, tons of meat. The ceviche was flavorful as well, and very tasty. I will definitely eat at El Fuego again and again! I'm usually not a review writer but something this good is worth writing about! I tried this truck for the first time this afternoon and the Classic Cheviche Mixto was awesome! The folks on the truck were very nice and mingled with their customers! That's the way to promote your business! That personal touch goes a long way in my book. I can't wait to try them again. I usually only post reviews to express what poor value or how not gourmet some food truck's product is when it is advertised to be otherwise. However, the ceviche was fantastic and was a very reasonable portion for $6. Flavors were balanced perfectly and I couldn't believe how fresh it was. I wouldn't normally get ceviche from a truck, but I also don't normally see ceviche being sold from a truck either, so I tried it out and I'm very glad I did. The Pan con Chicharron sandwich was awesome. For $8 you get a massive sandwich with very good quality ingredients. Everything tastes fresh and the amount of meat on the sandwich is really generous. I'm not used to getting a sandwich for $8 with well over a half lb of meat on it. I'm sitting at my desk still trying to finish it. I didn't get to try the daily special, which was a stewed goat, but I'll definitely try the truck the next time they're in the area. Very nice service too. Really glad to see a new option serving a reasonably priced, quality product. Hopefully my next experience is as good as my first. 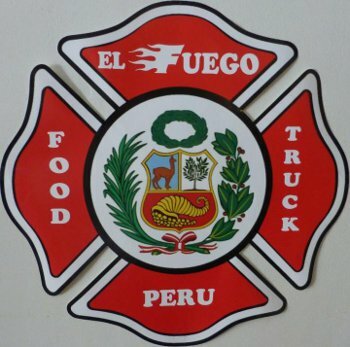 El Fuego is bringing delicious authentic Peruvian cuisine to DC and Virginia. 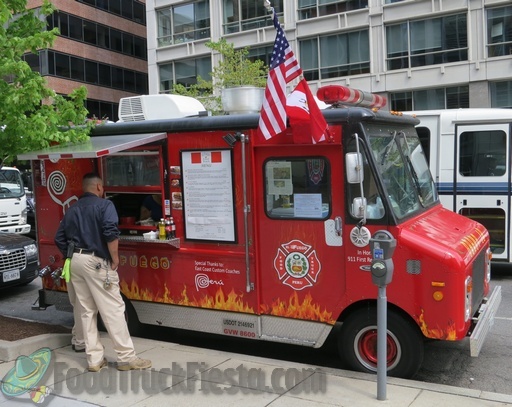 The food truck is themed as a fire truck and looks really sharp!